For those who have not been on Twitter lately, you have really missed out. 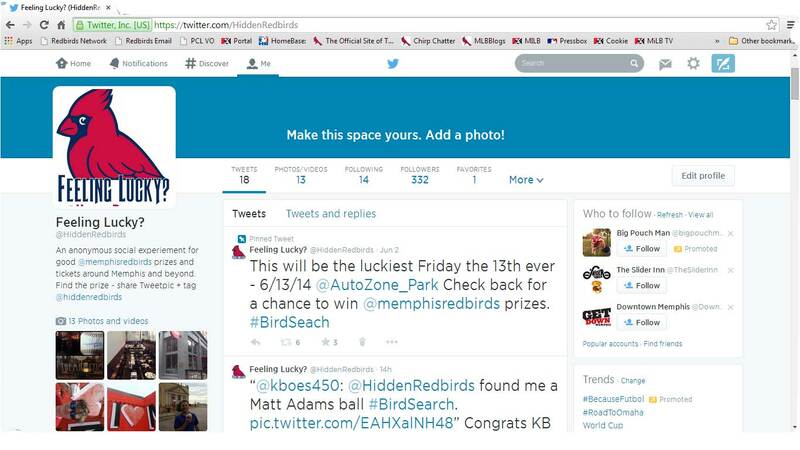 A new Twitter account, @HiddenRedbirds, has been giving away free prizes and giveaways around Memphis. The account has been tweeting daily locations and clues to what prize is on the other end of the giveaway. The climax of the account takes place on Friday, June 13 when the Redbirds play host to the Tacoma Rainiers at AutoZone Park. Several tweets will be sent out during the game that give fans the opportunity to claim cool stuff around the park. If you have not gotten tickets, there is still time left to be apart of our social experiment! How lucky are you feeling this Friday the 13th?